If you plug in the power supply, a couple of LEDs on the board should light up. If you don’t see them, try swapping the power supply. 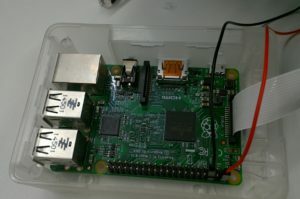 The one that worked for me was a white RPi branded one with plastic earth pin. Bonus hint: In normal use, the power supply should be the last thing you plug in. You will need to connect it to a screen. RPi evangelists burble about how they just hook it up to their TVs with an HDMI to DVI-D connector. If, like me, you have an early ’90s Grundig CRT TV, you will not be doing this. – I tried a 7-inch LCD TV monitor but this used standard video connectors that were electronically incompatible with the new digital world. The Maplin sales folk told me an expensive box would have been required to connect to the Pi’s HDMI. I see that eBay vendors are now selling little TV monitors with built-in HDMI converters for the Pi, but proceed with caution; mine was also advertised to work with the Pi. – I tried connecting it to my desktop monitor with a HDMI to RS-232 (serial) connector, but the screen stayed dark, no signal. At this point I didn’t know about the other problems and assumed that there was some power or signal mismatch. 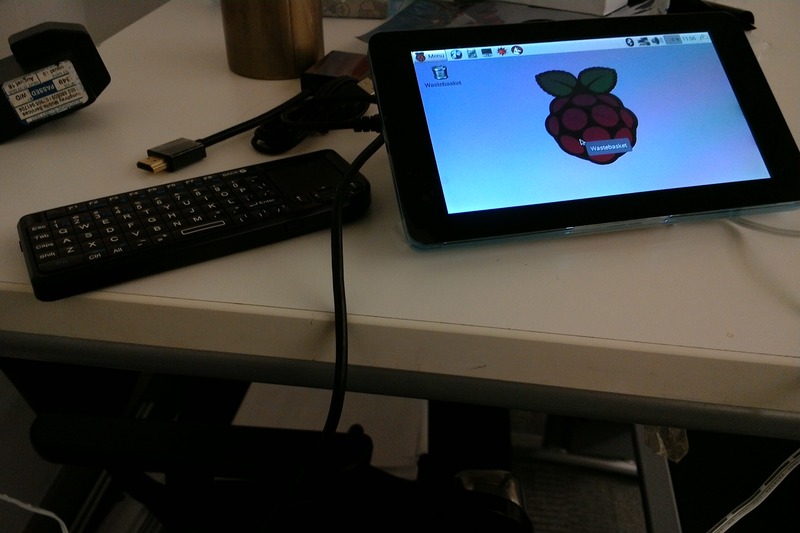 – Finally I gave up and ordered an official Raspberry Pi touchscreen. This had to work. 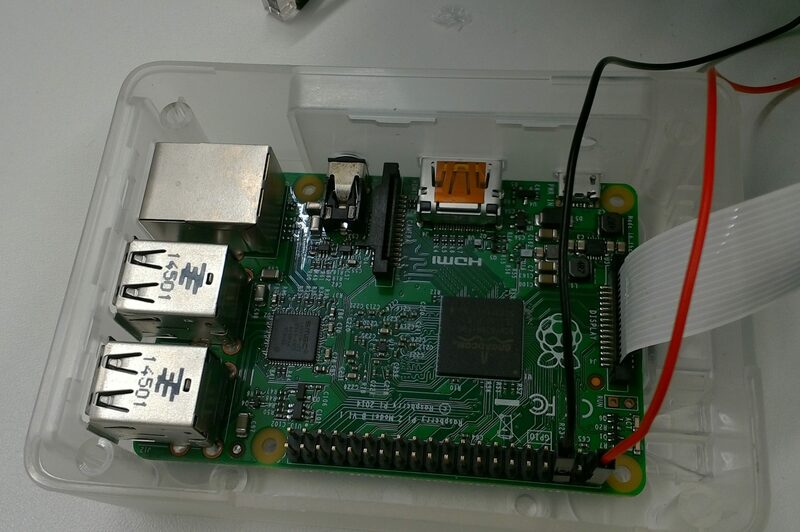 It had been introduced in September 2015, six months after I got my Pi. 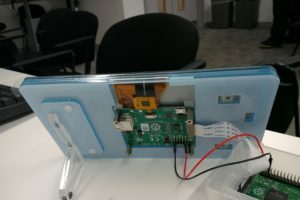 At the Jam, I connected the touchscreen display to the Pi with the ribbon cable, a thin piece of plastic that you might easily dispose of by mistake. To do this correctly, you have to notice which side the metal connectors are on, and match metal to metal. One trick I was told is to pull the port slightly up from the board while inserting. There is a sort of click, or at least a perceptible deceleration, when it’s seated. Even knowing this, it took several tries. I worried that the connector was now too creased to work but it was fine. There are two very similar flat connectors on the B+ Pi; I used the one at the edge. The screen also needs power. I was told that the best way was to use jumper wires between Pi and screen so that they can both run off the same power supply. It matters where they go (sockets 1 and 3 of the many on the Pi and the 1 and 4 of 4 on the screen. The joint power supply needs to go into the screen, not the Pi. Hardware was now properly set up, and still no joy. The problem was most likely the SD card. Information on SD cards, especially high-capacity microSD cards, is known to be a perishable commodity. What happens is first you can’t write to them and then you can’t read them. The cards are still supposed to last for 10 years or more. This one, now eighteen months old, appeared to have only 60 MB rather than the 16 GB that should have been addressable. I was advised to format it with SD formatter. Reformat card – 16 GB reclaimed – download NOOBS, unpack it, copy (flash) NOOBS to chip with Win32 DiskImager, or, to be fair, I think I followed some directions on a Pi site and just copied it, which may have been why it still didn’t work. An initialization screen came up but the system froze and the touchscreen did not respond. Actually the hardware still wasn’t set up correctly. 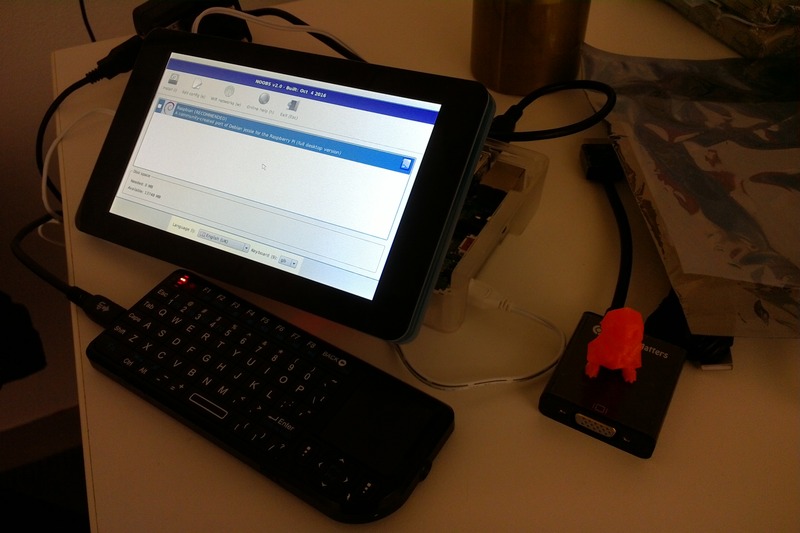 The mini keyboard was not meant to be connected by USB, but by Bluetooth dongle (found in a little drawer inside the keyboard). The USB-mini USB connection was for recharging only. Now it was correct and I restarted and still nothing moved. One of the gurus kindly offered to reflash the card a different way, using a “direct raspbian” version of operating system (possibly this one). It was very kind of him. I would have preferred to do it myself, I mean, that’s the point, but the jam was getting quite busy and instruction would have taken longer. After the reflash the setup worked. It only took a village. 10. Still to be tested: WiFi dongle. This entry was posted on 9 October 2016 at 6:07 am and is filed under Uncategorized. You can follow any responses to this entry through the RSS 2.0 feed. Both comments and pings are currently closed.